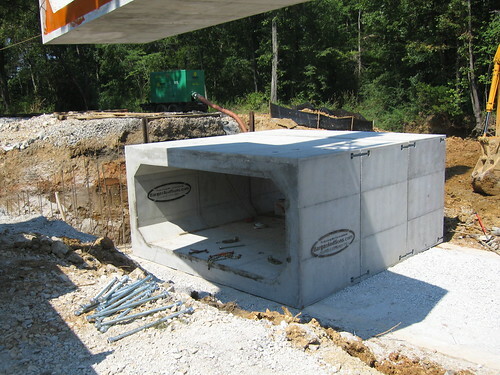 This section includes a suggested procedure for the proper installation of precast concrete box culvert. It is simply an information resource and is not intended to supersede project specifications with respect to procedures. Federal regulations covering construction safety are published in the Safety and Health Regulations for Construction under the Department of Labor, Occupational Safety and Health Administration (OSHA). 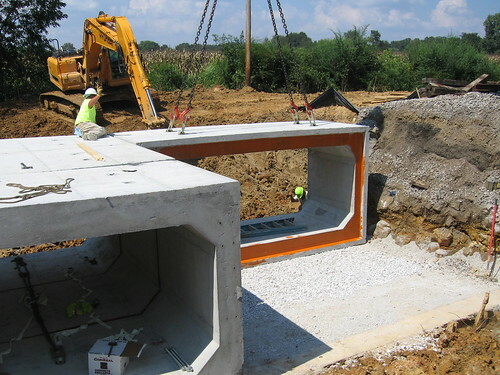 The precast concrete box culvert installer should be familiar and compliant with the pertinent sections and regulations of this document. The installer should also review installation practices with the engineer’s design assumptions, particularly in relation to the use of trench boxes, foundation preparation, joint gap allowances, and compaction requirements of the backfill. 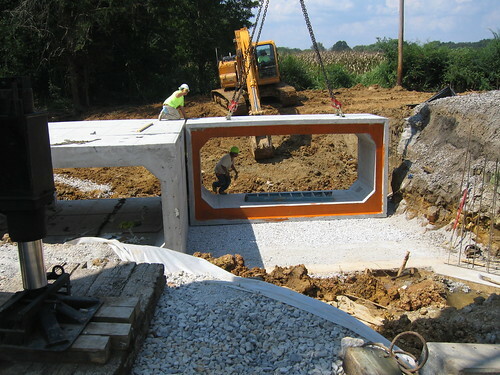 How is box culvert normally installed? Starting downstream working your way up stream with the spigot end toward the down stream and the bell end toward the up stream side. See the illustration below. Notice the small gap between box culverts. This varies between engineering firms and job requirements. Photo courtesy of BargerAndSons.com. A better look at the prepared base of flat stone. Photo courtesy of BargerAndSons.com. You can see from the below photograph that on each side of the box culvert four pocket formers are cast into the outside walls. These voids have a metal retainer clip that cast into the concrete to act as a washer for the all-thread and large nut. A look at one of two sides of the box culver that have the void formers with precast in washers. Photo courtesy of BargerAndSons.com. In the above photograph you can see the mechanical connections via the stainless all-thread rods, nuts, and washers in the preformed pocket voids (washers are cast in the concrete). This makes for a nice secure connection between each box culvert. Photo courtesy of BargerAndSons.com. Below you can see a box culvert mechanical connection up close.